DecisionsFirst Modeler is a collaborative decision modeling solution using the new Decision Model and Notation (DMN) standard. DecisionsFirst Modeler provides a diagram-based, business user friendly front-end to the business rules environment. The integration for JBoss BRMS links the graphical decision requirements models to business rules implemented and managed in JBoss BRMS, making it easier for the business rules architect and business owner to have a shared definition of the implementation while helping to lessen the constraints on the architect’s ability to make appropriate technical choices. Delivers traceability from business objectives through decision requirements to the business rules running in production to help maximize business engagement. Gives business users access to the rule editing and testing in JBoss BRMS Business Central based on their existing security profiles and lessening the compromises on management capabilities. 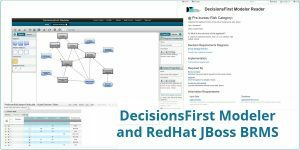 Links decision models to new or existing JBoss BRMS implementations, giving business rule architects and project stakeholders a common view across all projects. Links from both the modeling environment and mobile-friendly read-only reader to allow broad read-only access to models and keep everyone informed. Requires only the copy of the decision tables or business rules in JBoss BRMS, to help ensure that no duplication or re-generation of business rules is required to add decision model perspective. Uses existing JBoss BRMS versioning, deployment and management processes allowing business rules architects to exploit their existing investments in process and technology.